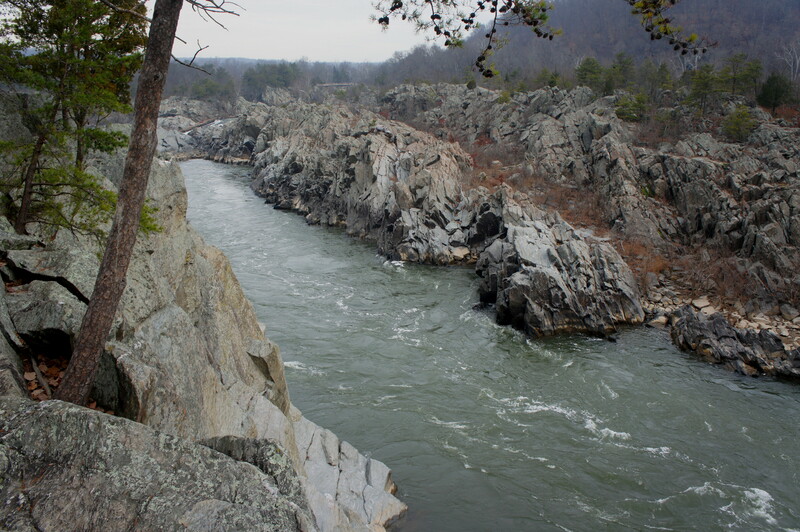 Most outdoor types in the Washington, DC area will know the famously rugged Billy Goat Trail on the Maryland side of Great Falls. 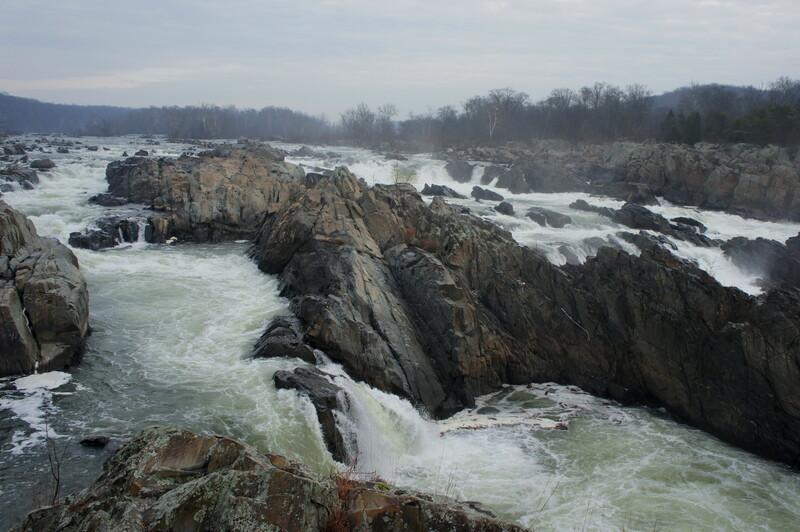 Across the river, however, is an equally—if not more—scintillating loop hike around Virginia’s Great Falls Park, featuring stunning vistas of the namesake falls and Mather Gorge, as well as a lovely meander along Difficult Run. That is not to say Great Falls Park does not get crowded on weekends; it certainly does. But the crowds thin the farther you get away from the falls, and in some sections in the southern end of the park, you are likely to have the place to yourself. Great Falls Park is best reached by car via Georgetown Pike. Entrance fees are $10 per vehicle, $5 per bicycle, though they are often waived for federal holidays and other occasions. There is ample parking around the Visitor Center, though a late arrival on a busy day could require parking up to ¼ mile away. The Visitor Center is large, shiny, and newly-renovated—the obvious center of activity in a park best known for its falls overlooks, hiking trails, and massive picnic grounds. While there are also hikes heading north from here (toward neighboring Riverbend Park), the best terrain lies to the south, starting with three easily-accessible overlooks of Great Falls. The first is situated less than 100 yards from the Visitor Center—this viewing area, at the end of a short spur, is the closest of the three to the mighty cascades. Great Falls tumbles a total of 76 feet over a series of whitewater chutes, broken up by islands of jagged greywacke, the predominant sedimentary rock layer in this area. It can be seen from a greater distance farther down the trail as well, from overlooks #2 and #3. (Note: While it is possible to reach each overlook in a wheelchair, some minor rock scrambling at the end is required to get the best views.) Near overlook #2 is an upright wooden marker denoting the upper reaches of six huge floods at Great Falls—the highest of which was the Pittsburgh Flood of 1936, the worst in the area to date. The main trail up until this point is the Patowmack Canal Trail (although there are few noticeable remains of the historic canal in this section). Roughly ¼ mile from the Visitor Center, however, the route forks: bear left to begin the highly scenic River Trail. 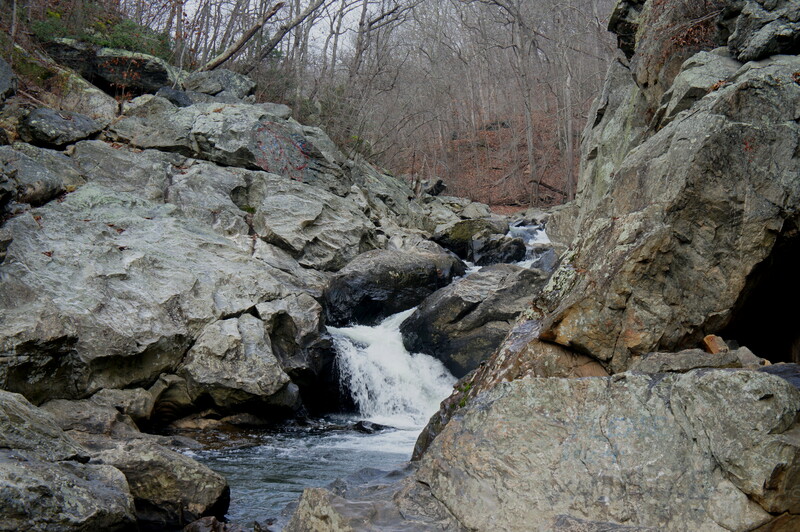 As the name suggests, this 1.5-mile path follows the Potomac River as it cuts through picturesque Mather Gorge—and forms a portion of the fantastic Potomac Heritage Trail, a long-distance route extending from Arlington, Virginia to Loudoun County. The route itself is noticeably rockier than the flat and wide Patowmack Canal Trail; a few boulders must be sidestepped and steps mounted. Frequent overlooks (including one featuring a plaque dedicated to Stephen Master, founder of the National Park Service) offer vistas of the gorge and the river, more than 50 feet below. On a nice day, rock climbers and kayakers are aplenty—though the latter face a challenge from the swirling rapids, formed by the narrow squeeze. Opposite the river are a series of large islands on the Maryland side. Six-tenths of a mile from the start, the trail forks again. Stay straight on the River Trail, quickly dropping down a flight of stairs and across a well-kept, wooden footbridge. As of winter 2015, a portion of the River Trail beyond the bridge is re-routed, edging southwest to meet the Patowmack Canal Trail next to a historic lock that is now all but clear of water. It quickly meets up again with the original path amidst a rocky trough that empties into the main gorge. Beyond the unmarked Canal Cut, the trail enters one of its more acrophobic sections—the path skirts the cliffside, providing for relatively unobstructed views of Mather Gorge. 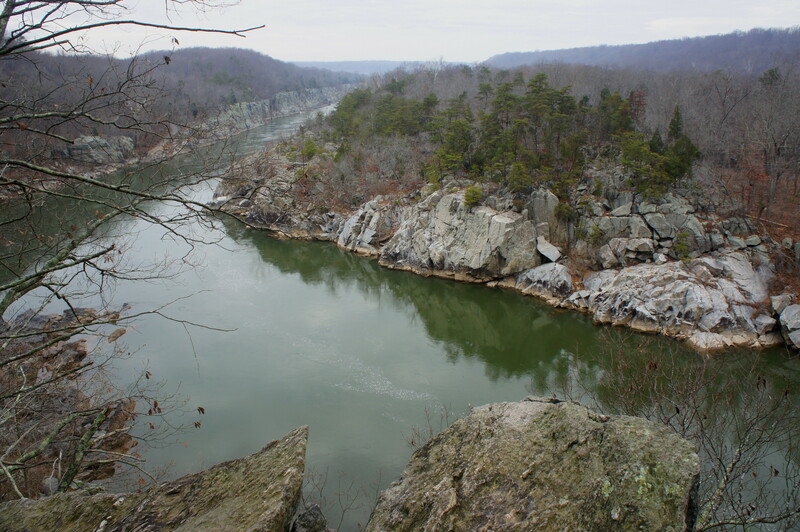 Peer across the river to the Maryland side to spot hikers on the famously difficult Section A of the Billy Goat Trail. It’s around 1/3 mile from here—along the cliff face and through another stony depression—to the next, four-way junction. Here a paved road (closed to vehicles) leads steeply down to Sandy Landing on the river. Continue straight on the River Trail and traverse the short bridge over a lovely, tumbling stream. At the next fork, the River Trail briefly merges with the Matildaville Trail before again splitting; stay left. 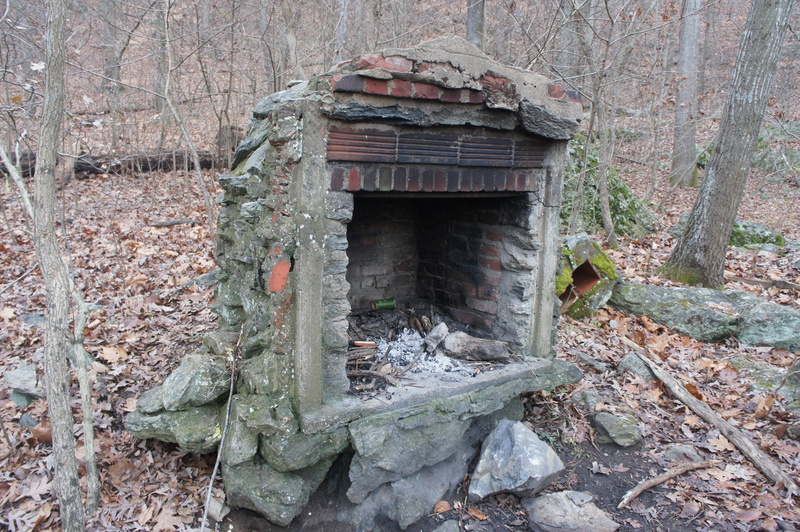 Two minutes later, the path passes a sight often seen on trails in the Potomac Gorge: an archaic furnace, built with stone, brick, and cement—probably the remains of an old outpost in what seems like a rather inhospitable environment. The next section can be characterized as a steady uphill, at first gradually, then sharply, climbing to Cow Hoof Rock, arguably the best overlook on the entire hike. 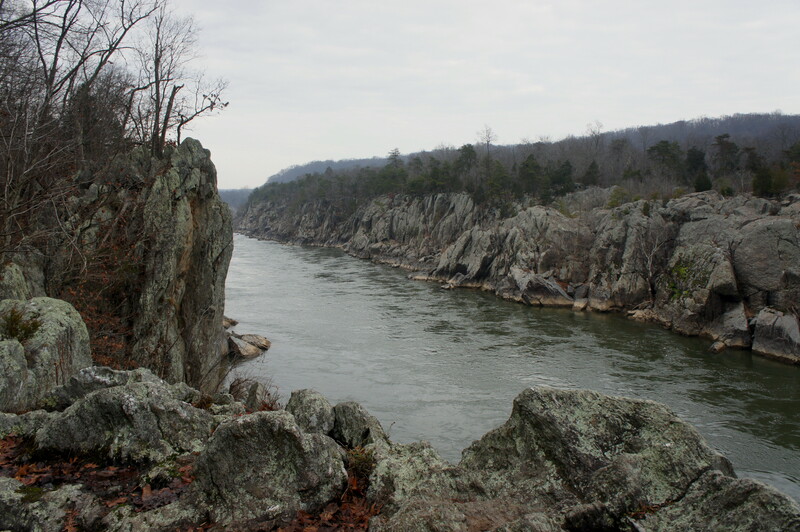 The outcrop is situated above a left-hand bend in the Potomac, offering excellent views to both the north and east. Here the river is more than 150 feet—a mostly vertical drop—below. From here, hikers should follow the Difficult Run Trail along the north bank of its namesake creek as it weaves through an exquisite valley, accentuated by a set of surprisingly impressive cascades. The first noticeable turnoff—a very steep descent—leads to the best viewpoint, situated at the foot of the largest and most impressive cascade. It’s an excellent spot for a snack (though alas, swimming is prohibited in Difficult Run). A second spur trail, located maybe 50 yards west of the first, leads down to a view of the cascades from atop the most impressive section. While the trail up to this point had remained high above the creek itself, it soon drops to stream level. 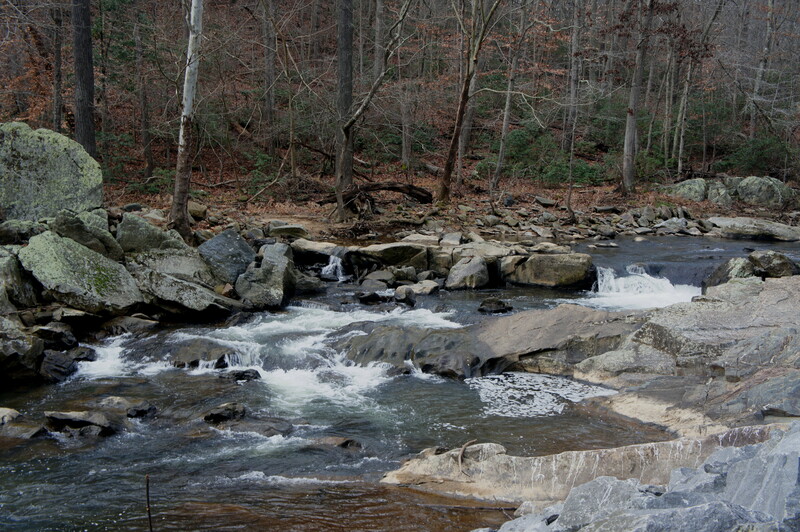 The whitewater in this section is far more subdued, and the stream soon settles into a relative stasis as the trail passes what appears to be a campsite, then approaches Georgetown Pike. While the main trail leads up to the road, stay left on the thinner path, which crosses under the road. From here, follow the aqua blazes for 1/3 mile to the Difficult Run parking area, a small and often crowded launching point for dog-walkers, hikers, and bicyclists. Having completed stage 1 (River Trail) and stage 2 (Difficult Run), it’s now time to begin the return journey, following a number of different trails back to the Visitor Center. 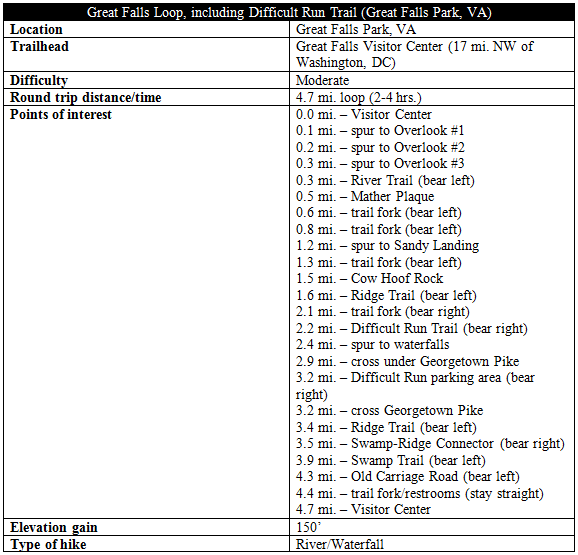 The first is a “secret” trail of sorts: well-trodden (and even signed) but not acknowledged on the official Great Falls Park map. On Google Maps, it’s labeled the “Wolfpack Trail” and begins directly across the street from the Difficult Run parking area. The footpath follows a woody ravine to its terminus, where hikers again merge with the Ridge Trail. Bear left at the intersection. A minute later, turn right at the signed junction, the official start of the Swamp-Ridge Connector Trail—which, as the name suggests, connects the Ridge Trail with the Swamp Trail. It’s on this leg that circuit hikers crest the highest point (roughly 280’) before descending a set of switchbacks down to yet another junction. Take a left—here the Swamp Trail skirts the left flank of the flat and marshy “swamp,” with bulky rock outcrops dotting the landscape on the left. After 4/10 mile, the trail spills into the Old Carriage Road, a heavily-trafficked thoroughfare that beelines back to the Visitor Center. From the end of the Swamp Trail, it’s about a 4/10-mile walk along the Old Carriage Road back to the start. For relatively quick hikers, allot around 2-2.5 hours for the round-trip. Add in at least another hour for off-trail exploration (such as overlooks and Difficult Run). 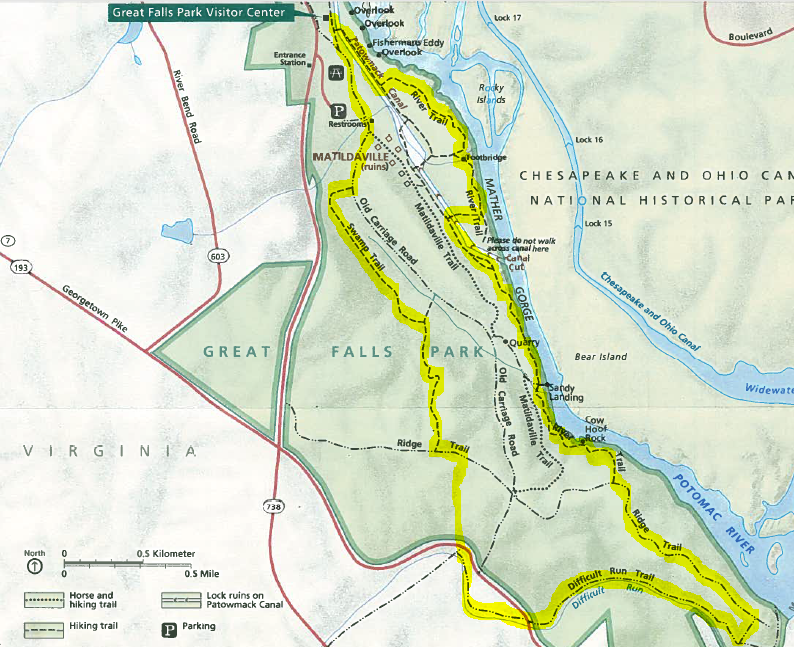 This entry was posted in Great Falls Park, Moderate Hikes, Virginia and tagged canyon, Difficult Run, Difficult Run Trail, Great Falls, Great Falls Park, loop hike, Mather Gorge, Old Carriage Road, Potomac Heritage Trail, Potomac River, Ridge Trail, River Trail, Swamp Trail, Virginia, waterfall, Wolfpack Trail. Bookmark the permalink.